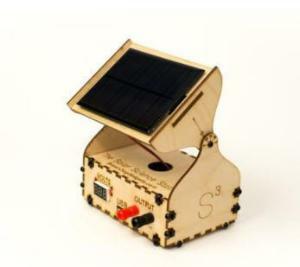 The Solar Science Station is a non-soldering solar USB charger. Use it as a tool for recording solar data in the classroom and as a power supply for gadgets. We've designed it around a large 6V 200mA solar cell that sits on a rotating axis (with degree measures), so you can adjust the angle. We have also engraved degree measures on the side. Record heaps of scientific data by having students measure the angle in degrees, the time of day, and the voltage output on the LED Voltmeter display! Ordering information: Parts include 6V 200 mA Solar Panel; Terminal Block; LED Voltmeter; USB Circuit; Banana Sockets; Laser Cut Wood Enclosure with Screws; and Optional Battery Pack.